The Institute of Photonic Sciences (ICFO) has launched of a call for a new fellowship award for female students with the María Yzuel Fellowship Awards. The focus of the awards is to attract outstanding female students to conduct a research internship or Masters work in an ICFO research group. By offering young women the possibility to explore science in a stimulating and supporting environment, ICFO hopes to attract, retain, and promote female talent towards future research careers in the photonic sciences. The awards program is named in honor of SPIE Fellow and 2009 SPIE President María Yzuel, a respected leader and role model in the international optics community. Active in the SPIE Women in Optics program, Yzuel is a longstanding advocate for the promotion of women in science and is an active member of the Asociación de Mujeres Investigadoras y Tecnólogas (AMIT-Association of Women Researchers and Technologists). Read the ICFO press release here. In a recent move towards encouraging more inclusivity and diveristy, SPIE created new awards and renamed a few existing awards. 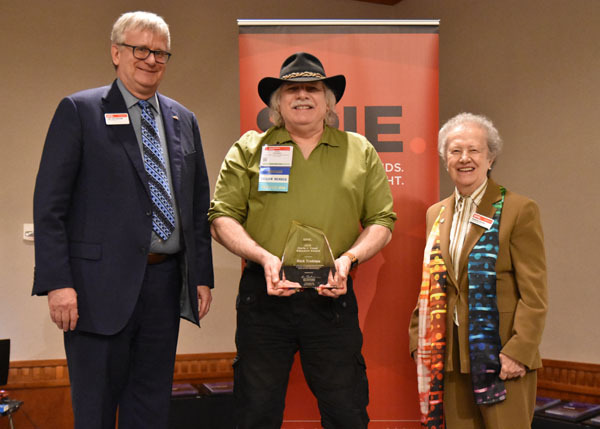 One such is the SPIE Maria Yzuel Educator Award, which recognizes outstanding contributions to optics education by an SPIE instructor or an educator in the field. The 2019 winner was Rick P. Trebino of the Georgia Institute of Technology, in recognition of his outstanding contributions to pioneering educational practices in optics and their implementation. SPIE President Jim Oschmann, left, and Professor Maria Yzuel, right, present Rick Trebino with the 2019 SPIE Maria J. Yzuel Educator Award.